I don't know if a true blue Kashmiri would approve of this stew but for me this Gogji Mutton curry speaks of winters. 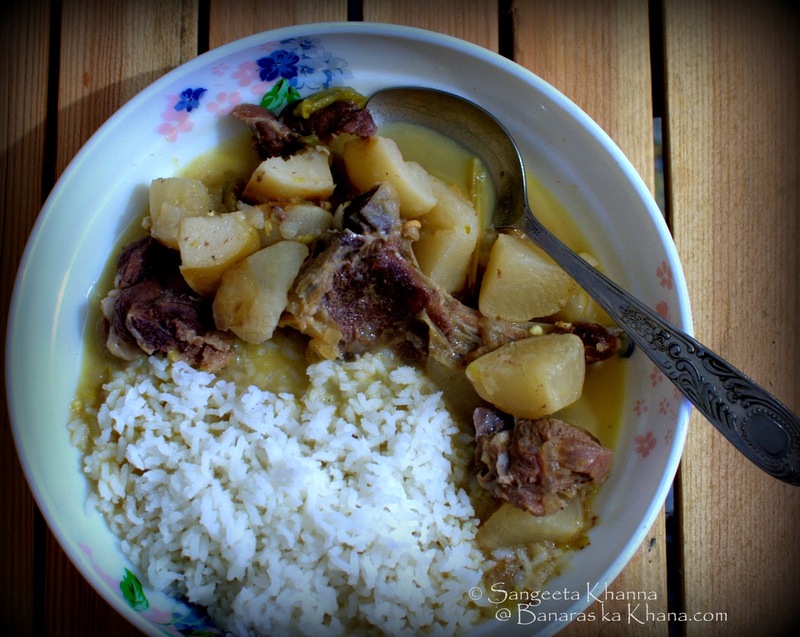 This simple stew is so good for a winter dinner, so warming that you would feel blessed if you get good turnips in your part of the world just for this mutton stew if not the vegetarian version called Gogji Nadir. I have adapted this gogji nadir according to my taste but I am sure the soul of the stew is not compromised with. 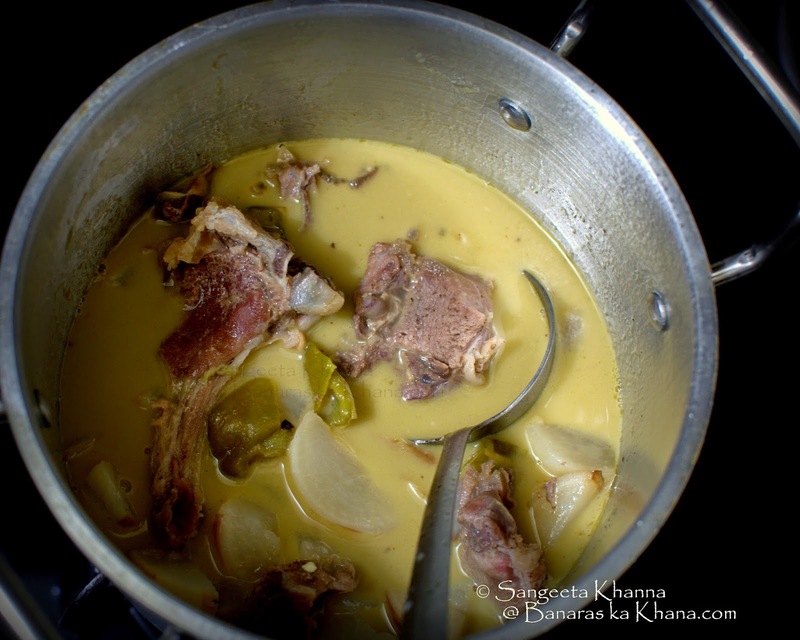 I have been cooking this gogji mutton for a couple of years and have learnt a trick to make the thin soupy gravy look almost milky in appearance and pack a punch of flavours that feels impossible with just three ingredients. Yes, apart from the mutton, there are only three ingredients that make the flavours so comforting. Mustard oil, green chillies of the thick skin variety (bajji chillies of Bangalore or Rajasthani pakoda chillies) and turnips. These three ingredients create magic in this stew trust me. It so happens that I always cook this stew for dinners and once it is ready we both can't wait too much to be able to click decent pictures to be shared on the blog. But this time I sneaked a couple of pictures while cooking and one picture of the plate that I served for myself. The pictures are still bad but I wanted you all to create this simple Kashmiri stew this winter if you have not tasted it already. Note how this recipe helps make an almost milky soupy gravy in this stew. The instructions typed in bold letters are the pointers. But don't worry even if the gravy looks watery, as the taste will not be affected much even in that case. 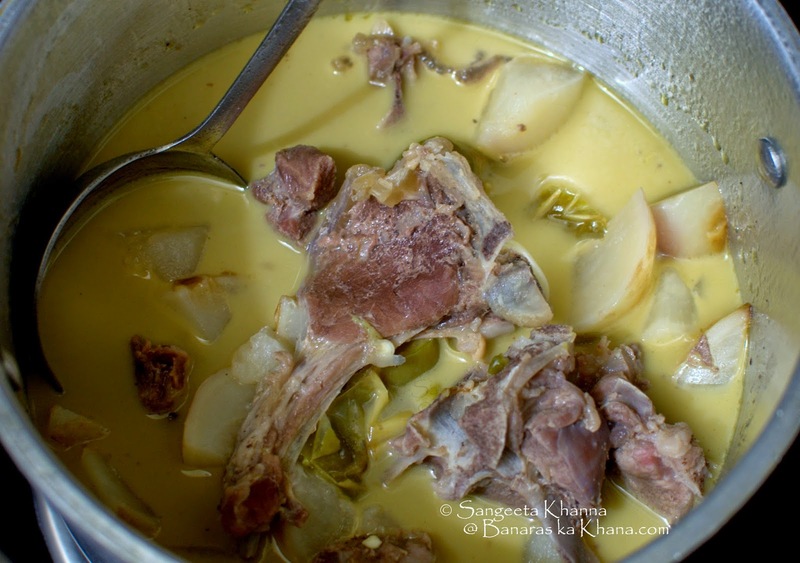 Add the mutton and a little salt to the water in a deep stock pot (or handi) and cook on medium flame for an hour or till the mutton is almost done. Or pressure cook the mutton with a litle salt with 1 L of water. Remove the stalks, clean and chop the turnips in irregular shaped thick slices. Try and not peel the turnips as some of the flavour will be lost if you do so. Chop the chillies in 1 inch long pieces and keep aside. When the mutton is almost done, heat mustrad oil in a deep pan till smoking point. Now add the chopped chillies and turnips all at once and toss and stir fry till a few blisters appear on the chillies and the turnips look glazed and blemished. This is the time the cooked mutton along with the hot stock will be poured right into the hot cooking turnips. By adding the hot mutton stock into the already sizzling turnips and chillies will make the stock look milky within seconds. Now check and adjust seasoning and simmer till the turnips are fully don, soft and disintegrate when pressed. Serve hot with plain boiled rice. Some plain home made yogurt or raita works with it but we don't care about it when we need a hot stew in our hands, preferably served in bowls. Less rice and more of this stew is my idea of a great home cooked meal on winter nights. Meals that we cook while watching TV and the home smells of a good stew being slow cooked in the kitchen. This stew is so aromatic that the neighbors can often get to know what is cooking, that too with such humble ingredients and not a single spice used. Simplicity brings the best from some foods. Gogji mutton is one of best example of such foods. Hope you would try this recipe if it is not a family favourite already. There are more recipes of turnips cooked with mutton in the Mughlai way and that has it's own charm, suited for a different kind of meal but gogji mutton will always be my all time favourite light mutton stews. Thank u so much for the wonderful recipe. Seems to be a very light and healthy dish. Will surely prepare the same and will share the feedback with u.